Father Christmas? – Sunshine. Whimsy. Tacos. Is this some form of Kringle that I’m not familiar with? When I walked by, the kid was reaching into his burlap sack, so it seemed like a Klaus variant. At ninety-eight, we all rotate. St. Nicholas, of course. He just… you know… *looks* like a saint. Well today is Sankt Nikolaus Tag (Saint Niclas day), the man is St. Niclas who gives candy or small toys to the good kids (he has a book with good & bad deads). Normally he should be in the company of Knecht Rubrecht (St. Noclases servant). Knecht Rubrecht has a big sack in which he puts the bad kids and takes them & they never come back home. 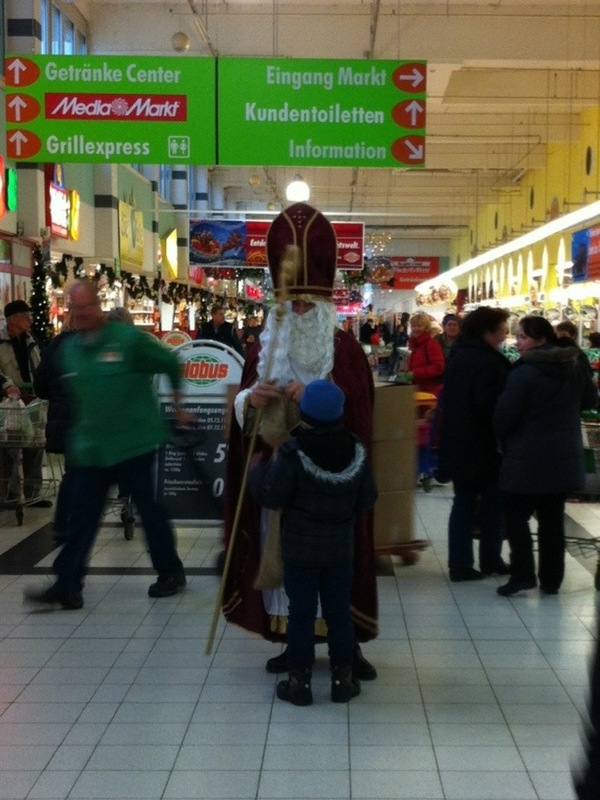 The head he wears is the official head dress of the catholic bishops as that is what St. Nicolas supposedly was. Bishops Wear Mitres (that kind of tall pointy hat he’s wearing in the pic). I am SOO jealous you are in germany at christmas time. Not cause of the religion aspect but its Germany… at christmas time.